The other day, when I made pUri again and chanA MasAlA as a side dish, I thought revisiting it and let you have the recipe of chanA MasAlA. Hence this posting today. *For pAnch pUraN take equal quantities of mustard, fenugreek, cumin seeds, aniseeds and kalaunjee (onion seeds), mix well and store in a bottle – if you have not got this mixture ready. Pressure cook the soaked white chick peas (Kabuli chanA) and keep aside. Cut onion, tomato and green chillies. Grind them into paste. Take oil in a kaDAi and when it is hot, add the pAnch pUraN spices, bay leaf. After spluttering, add the paste and sauté till the raw smell is off. Add the cooked peas, turmeric powder, salt and sugar with sufficient water to make it gravy. Boil till the contents become thick. In case the gravy is thin, take a little of the peas, grind well into paste and add to the boiling mixture. Remove from fire and garnish with chopped coriander leaves. ChanA masAlA is ready. 1. You can use chAt masAlA or garam masAlA in place of pAnch pUraN for a change of taste. However, these are to be added to the peas while boiling and not to be fried as pAnch pUraN. 2. You can replace green chillies with 1 tsp of red chilly powder. 3. Instead of making a paste of chick peas to make the gravy thick, you can pre-boil a small potato, mash and add. *If you do not use pAnch pUraN, use mustard while sautéing. Bengalis make this famous snack just to eat which is more or less equal to our ShuNdal, just loosened with masAlA. I have made some modification to this so that it can be used as a side dish for pUri and parAttA. While the ingredients for ghugni are same, the method in ghugni is to fry onion, ginger, garlic (crushed) and tomato pieces in oil and add the cooked peas without turmeric powder, bay leaf and sugar but garnishing the final product with fresh coconut shreds and chopped coriander. Instead of frying, I have ground them into paste as in the case of chanA masAlA, and followed the procedure also as described for it. Here you need to add the cumin seed powder with chAt/garam masAlA powder while boiling or if pAnch pUraN is added, do not add while frying but add in raw form while boiling the peas. 1. Refrigerate biscuits, cookies, savouries and all other crispy items in a container to keep them ever crispy. 2. Never wash electric and electronic appliances under water as the water will damage the circuits and cause electric shocks when you use them even if you dry. They may get short circuited and become useless. The best way is to wipe them externally with a wet cloth after wringing it thoroughly to squeeze excess water and dry. 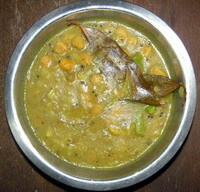 This entry was posted on March 22, 2011 at 11:53 pm and is filed under PUri & Alu Dum with tags bay leaf, biscuits, chana masala, chat masala, chick peas, cook, cookies, coriander leaves, cumin seed, electric appliances, electronic appliances, garam masala, garlic, ghugni, ginger, green chilli, Kabuli chana, kadai, onion, panch puran, pressure, puri, refined oil, salt, savouries, sugar, tomato, turmeric powder, white peas. You can follow any responses to this entry through the RSS 2.0 feed. Both comments and pings are currently closed.